Cracked windshield? Call our expert auto glass technicians today! We’re approved by all major insurance and fleet companies. Get the car and truck accessories you need under one roof. When car owners need dependable and affordable auto glass repairs in Sussex and the surrounding area, they rely on All Glass & Accessories. They’ve been in business for more than 35 years and offer services to both individuals and businesses. They handle stone chip repairs! Moreover, we carry a selection of plexiglass products and sell glass doors designed for wood stoves. Thanks to their state-of-the-art facility, the technicians at All Glass & Accessories can replace or repair windshields on the spot at a great rate. We even handle all the insurance paperwork on your behalf. To better serve our clients in the Sussex area, we offer a free vehicle pick-up and drop-off service! 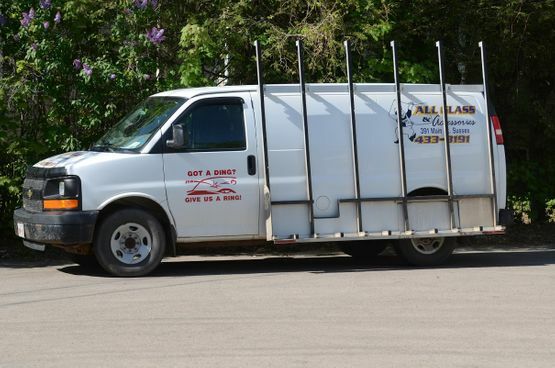 Whether you’re a car owner or own a large fleet of trucks looking for quality auto glass services, or you’re in the market for custom-cut glass surfaces for a variety of commercial and residential uses, call the technicians at All Glass & Accessories based in Sussex. ASK ABOUT YOUR INSURANCE DEDUCTIBLE DISCOUNT.